Baldwin, Long Island-located Baldwin Chevrolet and Motion Performance joined forces in 1967 to build serious street machines. Baldwin Chevrolet sold the cars that they, and their partners, modified. All kind of Chevrolets could be had: Novas, Camaros, Chevelles and Corvettes. They called their Phase III cars “supercars” and the term is apt. They guaranteed both an 11.5 second quarter mile time and a cruising speed of 120 mph. That’s some gearing! But then again, such gearing is made easy when the engine makes 600 horsepower. This car has a 7.9-liter (482-cid) V-8 “Elephant” motor making just such a number. It is the only engine like it known to exist. This car is a 15,000 mile car from new and is well optioned. It is all original and is the only one like it. Rare, period one-off muscle cars like this used to bring ridiculous money about 10 years ago. The market has softened but this is still a very valuable car. 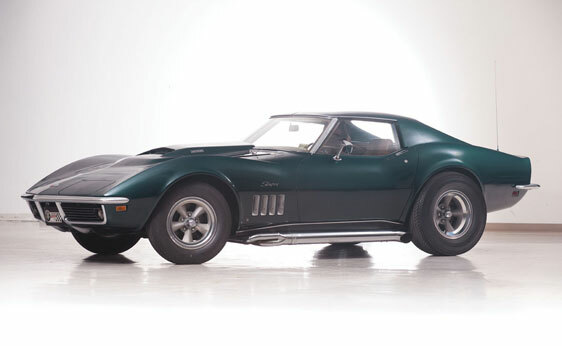 Click here to read more and here for more from Auctions America in Ft. Lauderdale. This entry was posted in Uncategorized and tagged 1969, auctions, auctions america, baldwin motion, cars, chevrolet, classic cars, corvette, coupe, muscle cars, phase iii by ClassicCarWeekly. Bookmark the permalink.